This is something that has puzzled me for some time. Do I actually need a digital mixing desk in my home studio? Well, technically no. Modern audio interfaces have a mixer on-board. So if you need 8 inputs, you could just make sure that you have an audio interface with 8 inputs. Starting at around 200 euros. Going up all the way to 3000 euro’s if you can or want to spend it for top quality. Now there are several reasons for me opting for a digital mixing desk and it all comes down to flexibility. What you don’t want is a chain of devices that add noise on every recording. So an analog desk connected to your digital audio interface is probably a bad idea. Unless it is a very high quality analog desk with a unique sound. Something that would set you back the price of a new car. So lets try to stay in the digital domain for a better price/quality ratio. One of the reasons to eye the higher priced segment of audio interfaces is the option of a direct cue mix. A singer, or solo musician is usually best recorded dry if you don’t have the luxury of working in a room with a nice sound or at least a quiet room. On the other hand lots of singers like to have monitoring with a bit of ‘room’ on it. A bit of reverb or even echo. When you can at least make a cue mix with just a touch of some effects on it, it can make the difference. Now lets have the best of both worlds and flexibility. I chose the Focusrite Scarlett 18/8 2nd gen. It has 16 inputs, 8 analog and 8 digital and 6 analog outputs. Additionally it has stereo S/PDIF digital in/out. hence the total of 18 in and 8 outputs. Now connect the digital mixing desk to the ADAT 8 digital inputs of the Scarlett audio interface and there you have it: 16 inputs and enough cue mix options to accommodate recording of a complete band. Ok, I was lucky to get my hands on a classic Yamaha 01V with ADAT interface, but I think it is still possible to get your hands on it or something equivalent for around 500 euros. Add to that about 300 euro’s for the Focusrite and there you have it: an affordable and also flexible setup that can accommodate any home studio recording session. 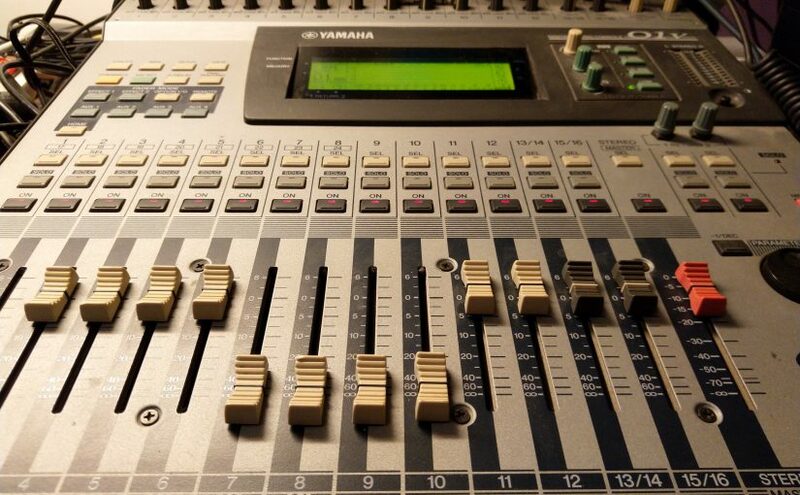 Posted on February 27, 2019 February 27, 2019 Categories Gear, Hardware, Mixing, RecordingLeave a comment on Do you need a digital mixer in your home studio? Just in, the gadget of the month: the Logitech Craft. I was looking out for some more control over the mixing process and of course there are many controllers. When you already have an Ableton Push what more do you need? Well actually there is a thing about me and Push. I cannot use it blindly, so I always have to look at either the screen, or the controls, or the display. When mixing in the Ableton Live arrangement view it gets worse. Mouse, keyboard, screen, Push… It is at its best in Session View. There were two things I was looking for. 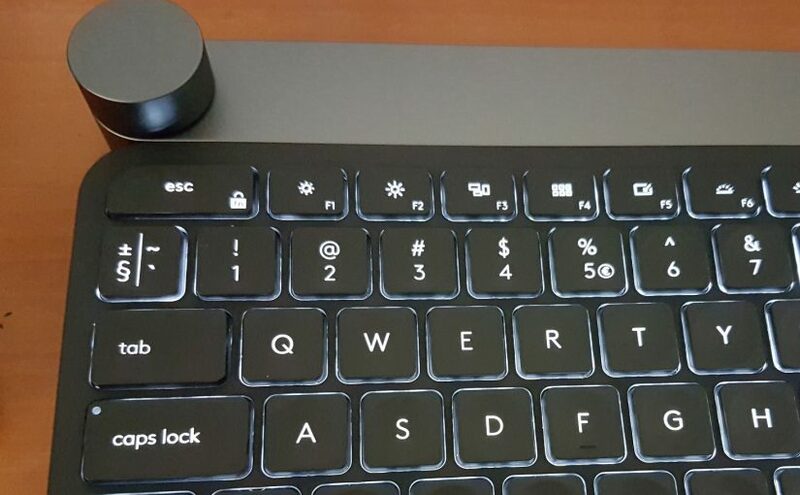 A high quality ‘chicklet’ keyboard like on my new Lenovo and it has an extra: A Knob. A dial that is touch sensitive and clickable to perform specific actions in any part of any program that has focus on your desktop. I am quite sure that your regular keyboard and a Microsoft Dial controller wil also make up good combo, but I chose the Craft to replace my old and clunky keyboard with media controls. Unpacking and installing was the easy part. The previous keyboard was also a Logitech and it used the same Unified remote. Switch on and off and the keyboard was connected. Then a disappointment! 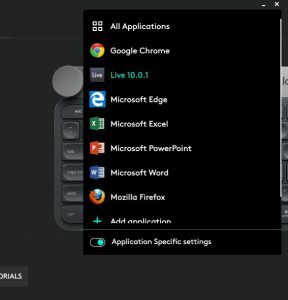 No profile for Ableton Live. With a profile the keyboard recognizes the program its in and it immediately adds some shortcuts to the knob to control. For instance in a browser you can select a tab with the knob. In Photoshop you can zoom. In Lightroom you can change the exposure, or so I’m told. 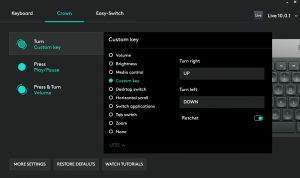 Standard functionality in other applications is controlling the volume of the PC and clicking it will pause/play music. So there I was staring at Ableton, without being able to use the knob. I started diving into the settings, and there i found the Development Mode. 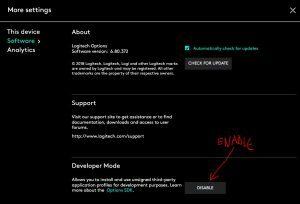 Click it and you will need to also enable sending stats to Logitech. Tough but there is no escape. From there you can select more programs to control with the knob and yes, Ableton Live is there! And lo and behold, assigning up and down buttons allows you to control Ableton Live mixing with the knob. A new world opens up, where you can look at the screen. Listen to the mix and control a setting in Ableton Live with the knob. This was what I was looking for, more control and a better keyboard for the daily typing chores. Yay!